10 miles on the schedule today. I ended up doing 12 miles. One of the advantages of doing an out and back run - you have to do the miles. I decided to go out six since I was feeling good. One of the disadvantages of doing an out and back run - you have to do the miles. Since my running buddy is still out of town, I planned on doing my run alone but at about mile 1, I met up with two gentleman that were running my pace so I stuck with them almost three miles. Man - did those miles fly by! Our conversation revolved around the usual - how long you running? What races did you do? What races you doing next? ect. ect. I wish I had met up with them at mile seven. They were already into their run for 7 miles and were only doing 10-12 miles. It was a nice break in the run though. So as you all know, I'm was honored to be selected into the Mizuno Mazamashii Project. I ordered my shoes this past week and received them yesterday. 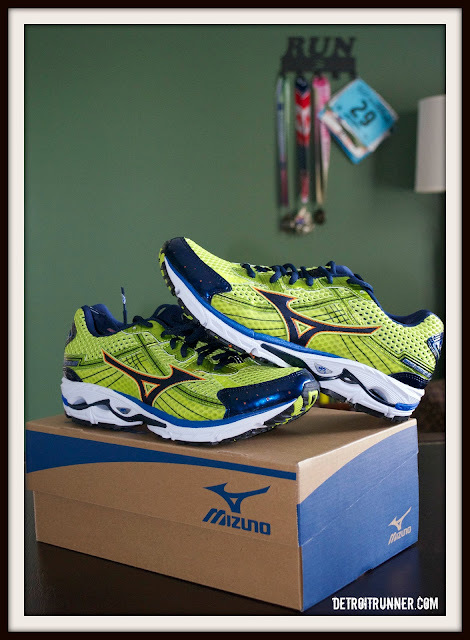 In addition, Mizuno has started a new website. It's the Mezamashii Run Project(brilliantrunnews(dot)com) Check it out. It's a really cool website. They have some really cool videos and pictures on the site. I can't wait to try them on my next run! I got the red ones -- the Limited 15s -- and really love them, too, though I feel a little like Dorothy in ruby slippers, though they make me work harder because they're so conspicuous that everyone looks at them and I don't want to be the lazy, fat guy running a gorgeous pair of running kicks. I can't wait to read your review.